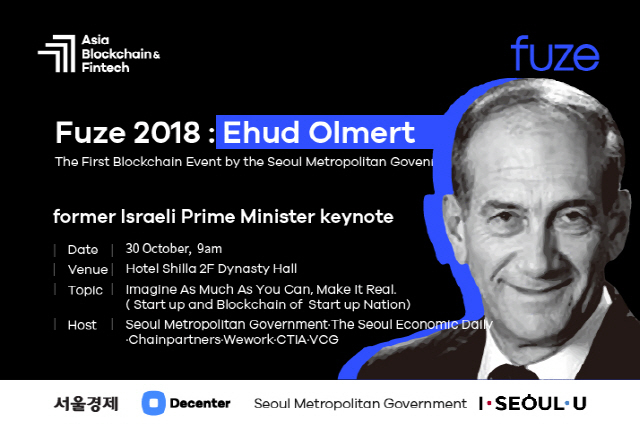 As former Israeli Prime Minister Ehud Olmert visits Korea to take part in the ABF in Seoul, attention is shifting to startup nation Israel’s blockchain technology and industry status. Olmert used to win fame for having linked Israeli businesspersons to CEOs of the countries he visited while serving as prime minister. He knew too well that government’s support was absolutely necessary to attract overseas capital and expand businesses. Olmert is the driving force behind Israel’s emergence as a startup and hi-tech nation. Israel is touted as the front-runner in cybersecurity, national security, semiconductors and other up-to-date technologies but it is equally strong in blockchain. The country’s blockchain industry has been showing outstanding growth. Israel is grafting blockchain technology onto new projects based on its strong information technology and full support for startups. Forbes ranked Israel 10th in the world in terms of innovation, citing its high adoption of technologies, patent applications and active moves to accept blockchain technology. According to a study by market research firm IVC Research Center in January, 10 companies based in Israel raised $480 million last year through initial coin offerings (ICOs). This accounts for 12.9 percent of the global ICO total worth $3.7 billion. Sirin Labs, a blockchain-powered smartphone maker, became the biggest fund-raiser with $157 million. The company developed an operating system and unveiled its smartphone Finney. This is a model making it possible to operate blockchain-based decentralized applications (DApps) and mine cryptocurrencies. It also supports various proofs through Sirin Labs Tokens. It’s remarkable that the company has unveiled a service less than one year after its ICO. Israeli companies are also active in adopting blockchain across the board, for example in fintech, security and media. According to the Start-Up Nation Central, Israel’s nonprofit organization, the small but strong country’s blockchain venture companies numbered 60 last year, up 60% from 38 in 2016. ICOs conducted in Israel last year numbered 17, showing its commitment to promoting the blockchain industry. Bancor, which is often picked as the role model of decentralized exchanges, originated from Israel. Israelis are also active in using cryptocurrencies. Statistics compiled by Coinhills put Israel 44th in Bitcoin transactions as of Sept. 29, exceeding Jordan (77th) and Egypt (60th). Israel ranks 99th in population with 8.45 million, compared with Egypt ranking 14th with 99.37 million. Four cryptocurrency automated teller machines were installed in Tel Aviv, Israel’s de facto capital, last year. People can buy and sell Bitcoin for shekel, Israel’s legal tender, via ATMs. Interest in cryptocurrency is quite high. Israel has a gathering of 10,000 Bitcoin enthusiasts, the second-largest in the world. “Considering that Israel’s population remains at one 40th of America’s, it’s an enormous size. This shows how popular Bitcoin is in Israel,” according to Bloomberg. The Israeli government is very receptive to cryptocurrency. Bitcoin can be used as a means of tax payment and its ICO regulations are also market-friendly. Ms Anat Guetta, who had strongly claimed to permit ICOs, was chosen as chair of the Israel Securities Authority in March. Israel’s press reported that the Bank of Israel teamed up with the finance ministry to plan the cryptocurrency version of shekel. Quoting an anonymous Israeli official, the Jerusalem Post reported that all transactions conducted through digital shekel will be recorded through mobile devices. Digital currency will be a good means of raising black market transactions to the sunshine thanks to its transparency. How does Israel, which is emerging rapidly as a blockchain powerhouse, look at Korea? At a time when the Korean government is at a loss over its cryptocurrency policy, it would be intriguing to see what insight it would receive from Olmert’s upcoming visit to Seoul.